The new book is out now! Or get the e-book version of this book for the Kindle. 'Memphis Wrestling History: Tennessee Record Book 1980-1989' Out Now! MWH's latest book is a record book that covers the entire Tennessee territory for the years of 1980 through 1989. This record book marks the first time wrestling historians Tim Dills and Mark James have collaborated on a project. The record book chronologically list all the known cards and results for the area. Not only are the Jerry Jarrett cards listed, but the Nick Gulas ones as well. Some of cities and results covered are from Memphis, Nashville, Jackson, Knoxville, Chattanooga, Tupelo MS, Louisville KY, Evansville IN, Jonesboro AR and many, many more. 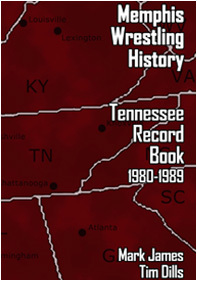 Memphis Wrestling History: Tennessee Record Book 1980-1989 (458 pp., B&W) is available now. It is currently priced at $22.99 and is available in print at AMAZON.COM as well as the publisher's WEBSITE. MWH is also glad to announce this book is available for purchase as an e-book on Kindle HERE at the price of $9.99. Click HERE to see a PDF file with a few sample pages from this book.